Tab to navigation to menu items. All of our services are designed with relaxation and luxury at their heart. Whether you have a couple of hours or a full day, our experiences will maximise your enjoyment and relaxation and minimise your stress. Your journey starts and ends in the Frigidarium. Surrounded by the intricate Italian mosaic floor, Islamic arches and Moorish design, you will become acclimatised to the warmth of the baths in this elegant relaxation room. The steam room, with high levels of humidity combined with eucalyptus infused steam, allows your body to relax, melts away tension in the muscles and opens pores helping to eliminate toxins. Intersperse your heat room experience with a plunge! Immerse your body into the cold invigorating plunge pool. The change in temperature improves circulation, flushes out toxins in the muscles and provides a toning effect. Throughout the Turkish Baths there are showers to wash away any impurities on the body and prepare your skin for the next experience. 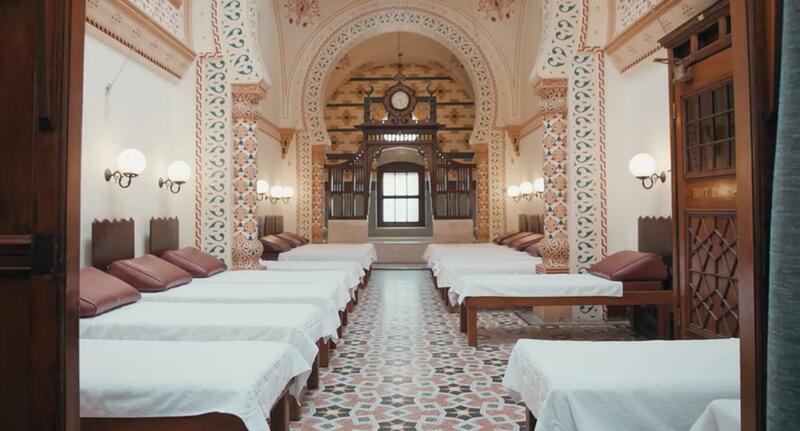 Allow a friend or loved one to share the experience of The Turkish Baths with a gift card. Fab experience, helpful staff, a simple pleasure. A lovely way to spend a couple of hours with your partner.